Can cerebral microbleeds cause an acute stroke syndrome? Studies suggest that the chronic accumulation of CMBs may have an effect on anatomically distributed cerebral functions including cognition.4 As microbleeds cause focal damage to the brain tissue,5 acutely developing microbleeds might be expected to cause focal symptoms. We report 2 cases of acute focal neurologic symptoms and clinical signs that in each case appeared to be due to a CMB. A 69-year-old right-handed man with known hypertension awoke feeling dizzy and unsteady (“as if the room was spinning around him”) and had numbness around his mouth and on his right cheek. When examined 2.5 hours later, his systolic blood pressure was >200 mm Hg and he had a right VII lower motor neuron palsy, gait ataxia, and gaze-evoked nystagmus on right gaze. An urgent CT head and CT angiogram showed no focal abnormality (figure e-1). MRI using a Siemens 1.5 Tesla scanner was performed on the same day. GRE T2*-weighted sequences showed a CMB centered on the right side of the base of the pons close to the root entry zone of the VII/VIII nerves (figure 1A). There were no areas of restricted diffusion to suggest acute ischemia. After 24 hours, the patient made a full recovery. Follow-up MRI at 5 months confirmed that there was no underlying vascular malformation. The lesion was still present, although somewhat fainter, likely due to technical factors (figure e-2). (A) MRI-brain gradient echo (GRE) axial T2* sequence showing a round 6-mm well-circumscribed hypointense lesion in the right pons in case 1. (B) MRI-brain GRE axial T2* sequence showing a 2-mm solitary brain microbleed in the ventral posterior nucleus of the right thalamus in case 2. A 78-year-old right-handed man presented with a sudden onset of paraesthesia over the left upper limb and left cheek. He had type II diabetes mellitus and hypertension. On assessment the same day, he was hypertensive (blood pressure [BP] 210/92 mm Hg) and had reduced cold and pain sensation in the left maxillary and mandibular territory of the left V cranial nerve and the lateral aspect of the left forearm. MRI and magnetic resonance angiography carried out on the same day revealed a single focus of susceptibility artifact within the right inferolateral thalamus, consistent with a CMB (figure 1B). No other CMBs were seen elsewhere in the cerebral hemispheres or brainstem (figure e-3). His BP gradually and spontaneously reduced to 133/63 mm Hg. The paraesthesia resolved over 72 hours. In each case, the lesions fulfilled the radiologic criteria proposed for CMBs: they were rounded, homogeneous, small areas of low signal seen well on GRE T2*-weighted imaging but not other sequences, and were more than half surrounded by brain parenchyma. 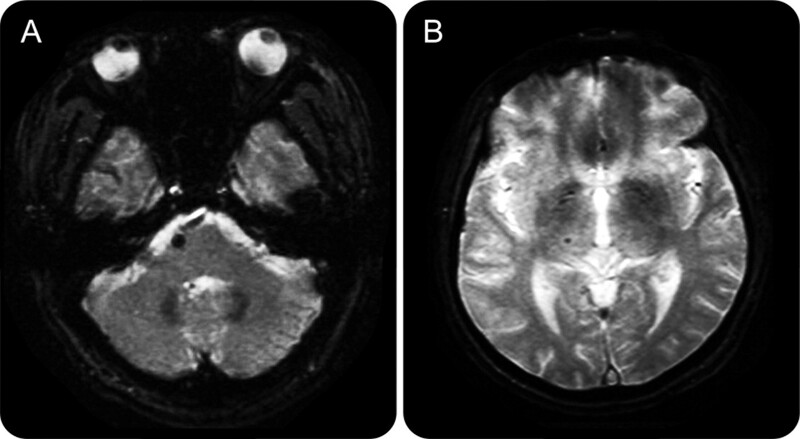 The lesions were not suggestive of mimics (e.g., calcium or iron deposition, flow voids from pial blood vessels, or partial volume artifact).6 There were no associated changes on other MRI sequences in the same regions (figures e-1 and e-3) and the lesions lacked the characteristic heterogeneous appearance of a cavernous malformation. A limitation of these 2 cases is that we do not have MRI scans shortly preceding their clinical presentation to confirm that the CMB is acutely responsible for their clinical syndrome. However, in each case, the CMB was found in a location typical for the clinical syndrome. In case 1, the CMB was in the pons adjacent to the facial nucleus, correlating with the clinical presentation. In case 2, the CMB was found in the inferolateral thalamus; lesions in this region typically cause hemisensory paraesthesias in cheiro-oral or pseudoradicular distribution similar to the case reported here. In case 1, the fainter appearance of the susceptibility artifact on follow-up MRI at 5 months is likely due to technical factors rather than resolution of the lesion as CMBs typically persist for months and years.6 Poorly controlled hypertension has been associated with the development of new CMBs7: it is noteworthy that both patients were severely hypertensive on presentation, which may have contributed to acute CMB development. A previous report suggested that a CMB could cause an acute stroke syndrome8; a patient with internuclear ophthalmoplegia was found to have a CMB in the medial lemniscus. However, in this report, the MRI was delayed for several months, with evidence of multiple lacunar infarcts, making it difficult to confirm that the CMB was the cause of the acute syndrome. In contrast, our cases were imaged within hours, allowing us to rule out acute ischemia and making any explanation other than the CMBs less likely. These 2 cases demonstrate the usefulness of GRE T2* MRI in the acute investigation of a TIA or stroke, and challenge the traditional view that CMBs are clinically silent. Further studies are required to determine how often CMBs underlie acute stroke presentations, and whether they correlate with specific syndromes. Dr. Teo has served as a consultant for and holds stock in GlaxoSmithKline and receives publishing royalties for Rapid Medicine, 2nd ed. (Wiley-Blackwell, 2011) and Rapid Surgery, 2nd ed. (Wiley-Blackwell, 2011) and 2 iPhone® apps. Dr. Ramadan reports no disclosures. Dr. Gregoire receives research support from The Stroke Association, UK. Dr. Mufti and Dr. Lipman report no disclosures. Dr. Jäger has received publishing royalties for Grainger and Allison Diagnostic Radiology: A Textbook of Medical Imaging (Churchill Livingstone, 2001). Dr. Losseff reports no disclosures. Dr. Werring receives research support from UK Department of Health and The Stroke Association, UK.
. Intracranial hemorrhage: gradient-echo MR imaging at 1.5 T: comparison with spin-echo imaging and clinical applications. Radiology 1988;168:803–807.
. Initial microbleeds at MR imaging can predict recurrent intracerebral hemorrhage. J Neurol 2007;254:508–512.
. Brain microbleeds as a potential risk factor for antiplatelet-related intracerebral haemorrhage: hospital-based, case-control study. J Neurol Neurosurg Psychiatry 2010;81:679–684.
. Brain microbleeds and global cognitive function in adults without neurological disorder. Stroke 2008;39:3323–3328. , Microbleed Study Group. Cerebral microbleeds: a guide to detection and interpretation. Lancet Neurol 2009;8:165–174.
. The microbleed anatomical rating scale (MARS): reliability of a tool to map brain microbleeds. Neurology 2009;73:1759–1766.
. MRI detection of new microbleeds in patients with ischemic stroke: five-year cohort follow-up study. Stroke 2010;41:184–186.
. Lateral gaze disturbance due to cerebral microbleed in the medial lemniscus in the mid-pontine region: a case report. Neuroradiology 2005;47:908–911.
. Antithrombotic drug use, cerebral microbleeds, and intracerebral hemorrhage: a systematic review of published and unpublished studies. Stroke 2010;41:1222–1228. LETTER RE: Can cerebral microbleeds cause an acute stroke syndrome? AUTHORS RESPOND: Can cerebral microbleeds cause an acute stroke syndrome?